I see my slurries go darker, faster when I leave them in beer. I see nice creamy-white slurries longer when stored in autoclaved water. I just started a new pitch of WLP004 from a slurry I saved from Nov 2014. Still creamy-white. About a day lag, but turned a 4L flask white (10 ml of slurry pitched) in 48 hrs. Some of these have been rinsed once, some are just crashed and I haven't got to them. Point is the small bottle with WLP004 from 11/14. Any residual sugars, dextrins, albumins, etc. will be nutrition for any contamination. Any breakdown of dead yeast will serve as nutrient for them as well. Pure distilled water ends up around 5.2-5.3 pH, so it is slightly acid anyways, simulating the antibacterial properties of beer pH. I believe that removing any fouling compounds from your slurry can only improve viability and storage life. If you are repitching quickly, then it is a moot point really. 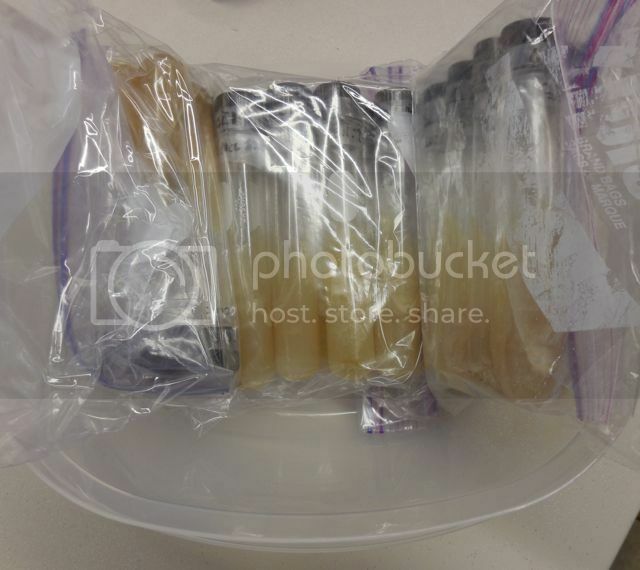 If you are putting a small sample of your yeast starter back as an inoculum for a future starter, then you should consider sterile distilled water as the storage medium. Even the yeast suppliers are championing it for long term storage. Didn't Hansen also show viability of 14 years when stored in de-oxygenated distilled water? It's not about the color of a crop. The color of the yeast darkens because the green beer darkens over time and stains the cells. Sure, some of the color change is due to aging, but most of the change is due to staining. The only way to know the viability of a yeast culture is to stain it under a microscope. If you are obtaining a lot of organic matter with your crop, then you need to revisit your casting-out and cropping techniques. Growing a starter from a crop taken on 11/14 is not a major feat. Five to five and half months is not a long time in the grand scheme of things when one considers the number of cells in a crop, even a small crop. I do not recommend it, but I have pitched crops that were that were much older without making a starter. 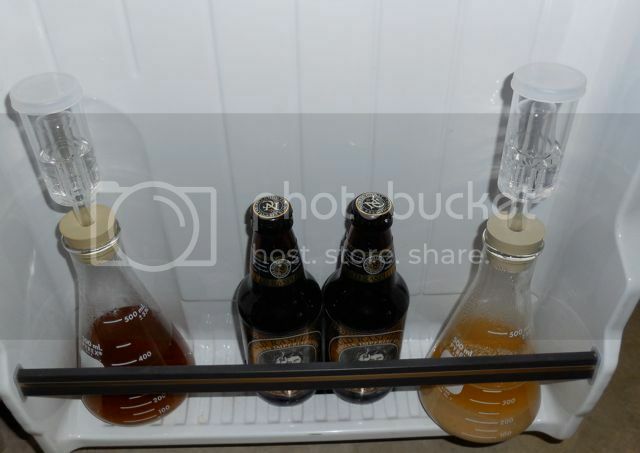 I am not the only one who has stated that yeast should not be stored outside of beer. Fermentis' parent company, Lesaffre, has an army of Ph.D. microbiologists, biochemists, and biochemical engineers on staff. They are a huge multinational company that handles yeast strains used in a wide variety of applications, including of human research. "In case of repitching, yeast must not be stored out of beer for long periods, even at low temperatures, as yeast glycogen levels will fall causing slow fermentations." Additionally, a pH of 5.2 is not low enough to prevent bacteria from growing. The pH has to be taken down to below 4.6 to halt most bacteria, especially pathogens like Clostridium botulinum. The reason why pathogens do not grow in beer is because the pH is below 4.6. If you consider residual sugars, dextrins, albumins to be major sources of food for wild microflora (most of which will never start because the pH is too low), then you more than likely have never prepared any laboratory yeast propagation media. Have you ever heard of YPD or MYGP? Guess what the "Y" stands for in these media? It stands for Yeast extract, which is the contents of yeast cells (the other part is known as "yeast hulls" after the extraction process has been completed). We know that rinsing yeast with and storing it under water removes the protective force field that the culture built for itself. Well, it also accelerates glycogen depletion. Guess what happens when yeast cells exhaust their glycogen reserves? They lyse and release their contents into the medium. Yeast extract is far more nutritious to wild microflora than what is left over after fermentation. "Yeast extract is the common name for various forms of processed yeast products made by extracting the cell contents (removing the cell walls); they are used as food additives or flavourings, or as nutrients for bacterial culture media. They are often used to create savoury flavours and umami taste sensations, and can be found in a large variety of packaged food including frozen meals, crackers, snack foods, gravy, stock and more. Yeast extracts in liquid form can be dried to a light paste or a dry powder." Finally, the whole rinsing and storing yeast under water thing is misinterpretation of research performed by the ATCC over twenty years ago. That research was conducted to find a means by which to store yeast for long periods of time without the need for refrigeration in countries such as Africa. However, that technique requires all traces of organic material and nutrients to be removed via centrifudge. 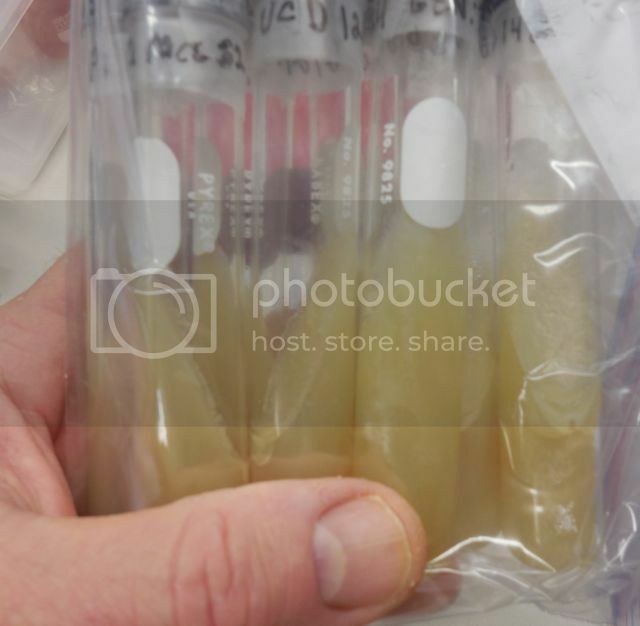 The culture that will be stored also has to be propagated under aseptic conditions using absolutely sterile media to avoid the threat of contamination. Finally, the stored yeast has be restarted under laboratory conditions, which makes the method impractical in a home brewing environment. It is much easier for small-scale brewers that lack access to -196C cryostorage to store yeast on subcultured slants. I have maintained yeast cultures on slant since 1993. The conclusion that all amateur brewers who are serious about maintaining a yeast bank reach is that liquid cultures are not the answer. It's much easier to verify condition and purity when yeast is stored on slant. Little late to the party, but I like your style! I've been overbuilding and harvesting from starters for years, but after a recent xBmt, I'm starting to think I might just start saving 500 mL of the spent cake for use on later batches. Wow, that's a lot of personal attacks over someone posting something contrary to your opinion. I'll be the first to admit to getting into arguments with Mark, but I don't see his response as an attack. My post was not meant as a personal attack. I may have made an assumption or two, which as we all know can result in making an a** out you and me. However, I was merely attempting to make a point. One thing that is critical about the storage of yeast under autoclaved distilled water is that all traces of nutrients have to be removed from the culture in order to force dormancy; otherwise, the culture will just burn through its glycogen reserves at a faster pace than it would if it had been stored under beer. This requirement was made clear when the ATCC was offering courses on the technique in Rockville, Maryland back in the nineties (Rockville is a Washington, D.C. suburb). I live in Maryland. I attended that course. The technique was developed for third-world countries. It involves storing well isolated colonies in autoclaved distilled water. As colonies grow on the surface of solid media, one can harvest nutrient free yeast cells. If one reads the links provided by mussledoc, both Clayton Cone and Chris White acknowledge this requirement. A lot of home brewers want to gloss over it in an attempt to generalize the technique to include rinsed crops (yeast rinsing is a darling on one the large home brewing forums). However, I have found no published data that supports the long-term storage of rinsed cropped yeast under absolutely sterile water. "Ad 3) It depends on how you store your yeast. There are reports that you can store yeast up to 1 year in distilled water if all sugars are removed. We have a little program running to test this and after one month the yeast is still fermenting well. But it is critical that all sugars are removed. A lot of breweries keep their yeast for up to a month under water (removing the wort/sugar residuals) without any problems." "Storing yeast under water, as opposed to under beer, is becoming more popular. 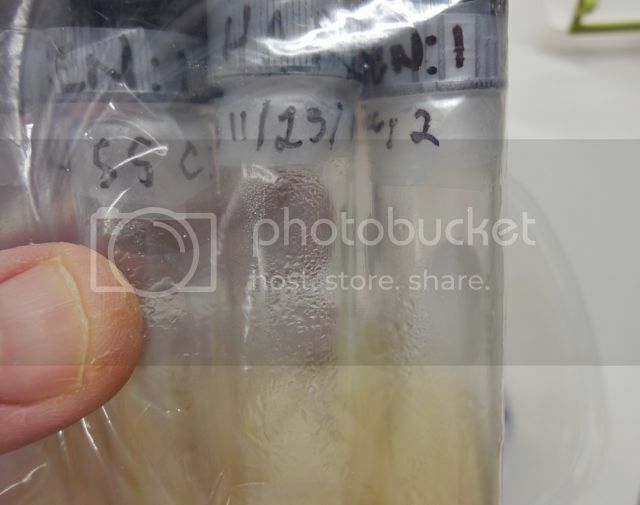 Sterile distilled water storage puts yeast in a resting state, and some reports suggest yeast can be stored in this manner for years, with no refrigeration. Storage under water is generally done with small quantities of yeast, which are then propagated in a lab. But it is possible that this can be applied to storage of yeast slurries. Some brewers are now trying this. The key is to use sterile distilled water and wash the yeast slurry several times in the sterile distilled water to remove any traces of beer. This is best done with a centrifuge, but that is impractical for most craft brewers. White Labs has had mixed success with sterile water storage, so time will tell if this procedure will work for craft breweries. " A key takeaway here is that Chris acknowledged that White Labs has experienced mixed success with the technique. White Labs has a fully-equipped quality control lab at their disposal. Please don't take the response as a personal attack. All views are welcome here, but Mark started the thread to assert why yeast rinsing at the homebrew level is not the preferred route, typically. Since slurry use by direct repitch is so widespread, many of us here follow that approach. Through purely anecdotal evidence, admittedly, following the Denny Conn approach of trying it for yourself and seeing what works best, I simply time my beers to have viable repitch yeast handy from one batch to the next and it has worked great. The greatest number of clean, non-mutated re-pitches for me was in excess of 20. By then, I figured I had stretched my luck and went to a new lab pitch from White Labs. I have stored several months and re-propagated without problems, but frankly I get my money's worth out of a batch if I use it 4-5 times. Also, I rarely make starters any more, opting for small batches that I step up until I get to my desired and typical batch (10 gallons for me). One thing is for sure - YMMV, so try different things and see what works best for you. Oh and one further thing to note: Mark uses amateur as a distinction from professional Brewers who brew for a living and likely have lab support to some degree. He is not using it in any pejorative sense. I chuckle at myself when I think back over the past couple years. My brewing knowledge journey started with the Palmer free on line book. By the way I don't think it will ever end. So I know that what I know now might not be entirely correct. My yeast use started with sprinkling US05, then rehydrating, then pitching smack packs, then making shook starters, the stir plate starters, the repitching x amount of slurry, the rinsing, then back to not rinsing, then to making stir plate starters with 100ml of slurry, to now I usually just make a oxygenated nonstirplate starter with a fresh smack pack. Last year I started making sours in the summer. Doubling my sour production this summer. So I've been listening to the sour hour, reading Chad Yackobson's brett dissertation page, and any other brett lacto pedio info I can find. This go around is a little easier on me because ive learned not to take everything as fact the first time I read it. When I share info I try to delineate between what ive heard and what I've experienced. Keeping always in mind that I am the furthest thing from an expert or scientist. I really dig mark's posts on yeast. Much of it is deep water for me. But I think he's right on regarding yeast rinsing and storing on water. Assuming perfect sanitation, the best you can hope for with rinsing and storing with water is that you might remove some trub, you might remove the most nonfloculant yeast (probably the liveliest or most attenuating of the bunch), and leave the survivors in a nutrient depleted solution. Not to mention that beer should be about 4.5 ph or lower, while water is usually 6.5 or higher. Anything over 4.5 runs the risk of incubating contamination, or so I've heard. Jim, are you using a pressure cooker as an autoclave? Maribeth Raines and Jeff Mellem used to sell a product called SuperWort. I would love to know what was in that mixture. I do 1.035ish wort with extra light DME and about a half teaspoon of wyeast nutrients. Seems to do the job nicely. Tho it would be interesting to try a maltose glucose peptone servomycyes combo. Not to sidetrack the thread but if I were to use the bottom cropping methods outlined by S. cerevisiae on the first page (paragraph 4, I believe) would the "thin slurry," i.e., 1 billion/mL setting on something like Mrmalty.com give me a decent estimate in terms of starter requirements (if not pitching immediately)? I've heard that most of the calculators out there give slightly (if not grossly) over-shot number in terms of what needs to be pitched and that the numbers get a bit fuzzy anyway due to a lot of factors that can't be accounted for by a few inputs on an online calculator. In that vein, can there be a point at which you've pitched too much yeast? Ridesalot above stated pitching a full liter of solid yeast - good lord! We almost lost your inquiry in the rush to discuss other stuff above. I'm no scientist, nor have I played one on TV, but I would use a relatively thin slurry setting on Mr. malty, doing what Mark describes (a quart or so of beer left to swirl up the slurry). Too much yeast? Yes, it seemed to create a bit of a flabby beer - not all of the qualities that come from a pitch that allows the yeast to go through its full cycle - kind of stressing it by not allowing as much reproduction as would be the case with a lesser, but adequate pitch. I had that result with a very large pitch in a pretty modest lager wort. You could drink it, but it was pretty much lifeless. I do not harvest the complete contents of a fermentation vessel. I limit my thin slurry crop to 350ml (I use 500ml Erlenmeyer flasks for crops). I limit my crop volume in order to insure that I collect the cleanest portion of the re-suspended solids. I usually obtain between 150 and 200 milliliters of solids out of a 350ml crop. I pitch between 100 and 150 milliliters of thick slurry, which contains approximately 1.2 billion yeast cells per milliliter for estimation purposes. And 150 to 200 ml of relatively fresh slurry is enough to pitch directly into around a 10 gallon batch, if I recall correctly. At least that is in the neighborhood of where I am at for ales - a bit more for lagers, perhaps. I go to Mr. Malty based on my gravity and figure out what I need to pitch, but I try to avoid the monstrous pitch for the reason stated above.